The Siena Hotel, named after a small city in Italy and inspired by a Tuscan Villa, creates lifetime memories through personalized service and unparalleled dining.We connect with travelers who share a love for life and an appreciation of the journey. At The Siena, we offer our patrons an electric experience – a fusion of architecture, intimacy, and culinary artisanship. When we set out to build the Siena, there was one central idea...to make every room look and feel like a world-class luxury boutique hotel. Seventy-nine very special, well-appointed sanctuaries, with space to stretch out, relax and forget the cares of the day. All of the rooms and suites are very spacious with 12' ceilings, Juliet Balconies, sitting area, large marble bathrooms and modern amenities. With almost 4,000 square feet of meeting space, The Siena Hotel is the ideal place for a training seminar or executive board meeting. And our professional and experienced staff will ensure your meeting is a success. We can accommodate small, large, day or evening events. Celebrate any type of special occasion, from corporate holiday parties to birthday celebrations, here at The Siena. Inspired by the beauty of Italy, The Siena Hotel - located in beautiful Chapel Hill, North Carolina will captivate you with its elegance. The Siena Hotel, Autograph Collection, is an upscale boutique hotel. AAA rated Four Diamond hotel and restaurant recipient since 1987, the Siena Hotel adds its distinctive European character to the Raleigh/Durham & Chapel Hill, NC area. Step through the doors of this elegant Tuscan villa to discover a luxurious décor of hand-selected European furniture, Italian marble floors and majestic columns, against a backdrop of rich colors and fabrics. We look forward to seeing you soon. As our guest, you can expect a higher level of personal attention. Your experiences can be as unique as you would like them to be. Requests from the simple to the sublime are handled with an international flair and attention to detail. Expect the extraordinary; let us know how we can make your stay uniquely yours. Contact our concierge or reservation desk to create a custom package, and we will help make your experience at The Siena truly unforgettable. 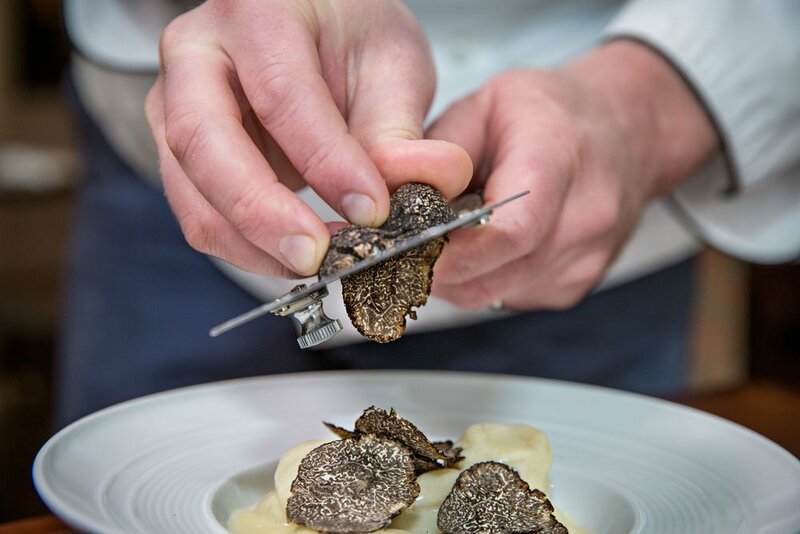 Consistently awarded Four Diamonds by AAA and acclaimed by Conde’ Nast, Il Palio offers the finest Italian cuisine by Executive Chef Adam Rose and his staff, along with choices of some 400 wonderful wines. The service is world-class, provided by an attentive, but un-intrusive waitstaff. Surrounded by the rich colors and fabrics of an Italian villa with contemporary European touches, the atmosphere at Il Palio will take you to another place and time. As in Italian culture, we take effort to shorten the time and distance between the ingredient’s source and the plate. We strongly believe in the rich freshness of seasonal ingredients proudly purchased from local farmers and friends. We import pasta from Naples, Parmigiano-Reggiano, balsamic vinegar, sea salt, Prosciutto di Parma, extra virgin olive oil and truffles only because their distinct flavors make them virtually indispensable to the creation of a great Italian meal. We craft our own pasta and fresh bread daily. Our simple, straight-forward desserts unveil savory components drawn from Italian tradition. As a winner of Wine Spectator’s Award of Excellence, Il Palio features wine from Italy’s 20 regions produced in every corner of the Italian Peninsula.